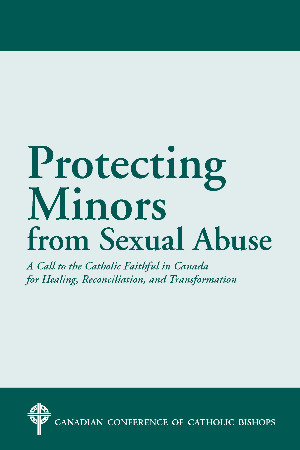 Protecting Minors from Sexual Abuse: A Call to the Catholic Faithful in Canada for Healing, Reconciliation, and Transformation arises as a response by the Catholic bishops of Canada concerning the need to update and expand their efforts at safeguarding pastoral environments and to improve responses to complaints regarding the sexual abuse of minors and vulnerable adults. Drawing on the experience of the leadership of the Catholic Church in Canada, on the expertise of numerous professionals, on the insights of victims, and on the latest canonical requirements of the Holy See, the present document will be an indispensable resource to those – be they clergy, consecrated persons, or laity – who, in view of their specific ecclesial responsibilities, hold positions of authority and have oversight of pastoral staff and volunteers. This document will also be of interest to the Catholic faithful at large as they participate in the Church’s efforts to undergo the purification and transformation which have become urgent in order for the Gospel to continue to be faithfully and credibly proclaimed and lived out in every community and at all levels of society.